Following the Senate Intelligence Committee’s report on CIA interrogation practices in the period following the Sept. 11, 2001 terrorist attacks, 51% of the public says they think the CIA methods were justified, compared with just 29% who say they were not justified; 20% do not express an opinion. The new national survey by the Pew Research Center, conducted Dec. 11-14 among 1,001 adults, finds that amid competing claims over the effectiveness of CIA interrogation methods, 56% believe they provided intelligence that helped prevent terrorist attacks, while just half as many (28%) say they did not provide this type of intelligence. Partisan divides on these questions are wide. 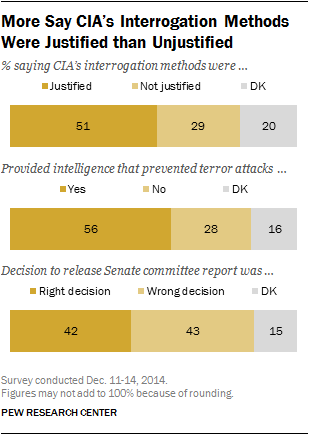 A large majority of Republicans (76%) say the interrogation methods used by the CIA after 9/11 were justified. Democrats are divided – 37% say the methods were justified, while 46% disagree. About twice as many liberal Democrats (65%) as conservative and moderate Democrats (32%) say the CIA’s interrogation techniques were not justified. Overall, the public expresses the most doubt not about the CIA methods and program itself, but about the Senate committee’s decision to release its report: as many call the decision to publicly release the findings the wrong decision (43%) as the right decision (42%). Opinions about the CIA’s post-9/11 interrogation methods are divided by race, gender and age. Nearly six-in-ten whites (57%) say the methods were justified, while 26% say they were not justified. Blacks and Hispanics’ views are more divided: 42% of blacks say the methods were justified compared with 38% who say they were unjustified. Among Hispanics, 43% say the CIA’s methods were justified vs. 30% who think they were unjustified. Young people also are divided over the CIA’s post-9/11 methods: 44% of those under 30 say they were justified while 36% disagree. Among those 50 and older, most (60%) think the methods were justified. Men say the CIA’s interrogation methods were justified by a 57%-28% margin. Women are somewhat less supportive: 46% call the methods used by the CIA following the September 11th terrorist attacks justified, while 30% say they were unjustified. Among the roughly quarter of adults (23%) who followed news about the release of the Senate committee’s report on CIA interrogation very closely, far more think the CIA’s methods were justified (59%) than unjustified (34%). Among those who f0llowed this news less closely, 49% say the CIAs tactics were justified, 27% unjustified, while 23% do not express an opinion. Comparable shares of Republicans (27%), Democrats (23%) and independents (22%) tracked news about the release of the Senate report very closely. Partisan divides on this question are wider than those seen across demographic groups. By an overwhelming 76%-12% margin, Republicans view the CIA interrogation methods as justified. Support among Democrats is nearly 40 points lower: just 37% call the interrogations justified, compared with 46% who say there were not justified. Somewhat more independents say the CIA actions were justified (49%) than not (30%). Differences between Republicans and Democrats over whether or not the CIA methods were justified extend to other questions about the program. About three-quarters of Republicans (73%) say CIA interrogation methods provided intelligence that helped prevent terrorist attacks, compared with just 15% who say they did not do this. By contrast, Democrats are evenly split; 43% say the interrogations led to intelligence that helped prevent terror attacks, while 40% say that they did not. And partisans take differing views on the Senate committee’s decision to publicly release the CIA report. Republicans call it the wrong decision by a 64%-26% margin, while Democrats say it was the right decision (56%-29%). Liberal Democrats are much more skeptical about the CIA methods and program than are conservative and moderate Democrats. Overall, 65% of liberal Democrats say they were not justified, while just 25% say that they were. The balance of opinion among conservative and moderate Democrats is much different: 48% say the CIA interrogations were justified compared with 32% who say they were not. Similarly, fewer liberal Democrats (35%) than conservative and moderate Democrats (53%) believe the CIA interrogations provided intelligence that helped prevent terrorist attacks. And on the question of whether the Senate Intelligence Committee was right to publicly release their report, 71% of liberal Democrats call this the right decision, compared with about half of conservative and moderate Democrats (48%). By contrast, within the Republican Party broad majorities of both conservative Republicans and moderate and liberal Republicans say the CIA interrogation methods were justified and provided intelligence that helped prevent terrorist attacks.